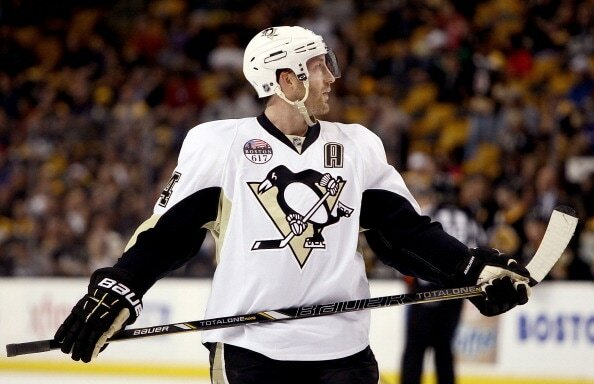 The Penguins wore Reebok Edge (Air-Knit) jerseys - a style and cut that was introduced at the beginning of the 2007-08 NHL season - for the sixth consecutive season. The Reebok wordmark was featured on the back neckline with a white wordmark sewn onto black twill on the Home (black) jerseys, a black wordmark sewn onto white twill on the Road (black) jerseys, and a white wordmark sewn onto navy blue twill on the Alternate (navy blue) jerseys. The inside neckline of each jersey features a size tag with a Canadian flag logo above the "Made in Canada" in three languages (English, French and Spanish) then the 7187 manufacturer's model number indicating the 2.0 Edge model with an "A" or "H" after the model number. Inside the left side seam is a manufacturer's washing instructions tag. For the second consecutive season, JerseyTRAK technology from Gleason Technology was sewn inside the base of the fight strap which allows the Penguins equipment staff to scan each jersey before and after the game in which it is used. Jerseys were lettered and numbered by Pro Knitwear of Pittsburgh, PA. Each jersey featured a set tag sewn inside the rear hem. 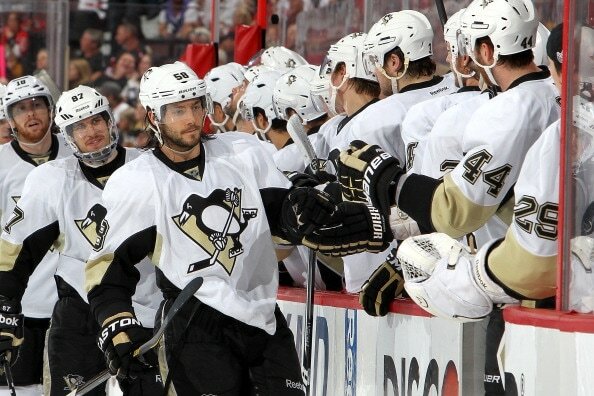 The Penguins began wearing Set 1 jerseys with the start of the 2013 regular season on January 19, 2013 at Philadelphia. The set continued until the end of the regular season and was last worn on April 25, 2013 at New Jersey. The Home (black) jerseys were worn in a total of 18 games while the Road (white) jerseys were worn in a total of 23 games. Each individual jersey within the set was worn as allocated by the Pittsburgh Penguins and Gleason Technology's JerseyTRAK reports should be referenced to determine exactly when each jersey was worn. 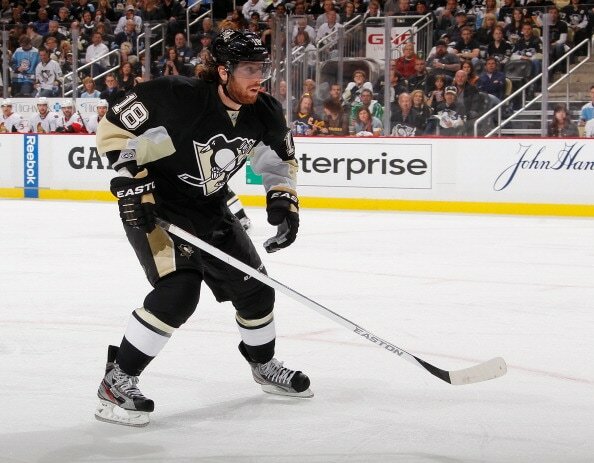 The Penguins wore their Alternate jerseys a total of five times in 2013 beginning with the game on February 10, 2013 vs. New Jersey. 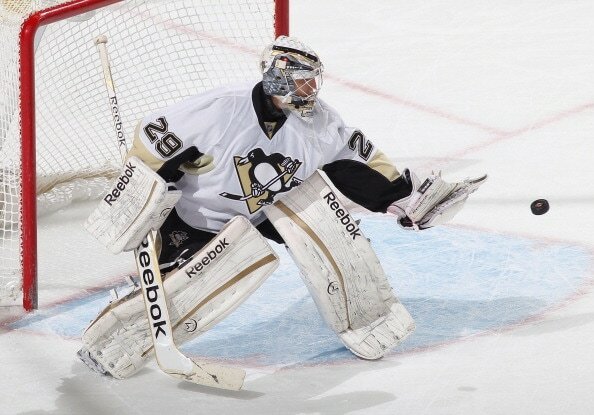 The set continued throughout the the regular season and was last worn on March 30, 2013 vs. NY Islanders. 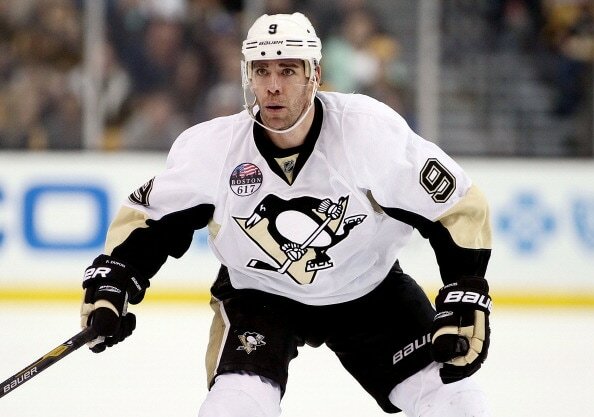 Each individual jersey within the set was worn as allocated by the Pittsburgh Penguins and Gleason Technology's JerseyTRAK reports should be referenced to determine exactly when each jersey was worn. 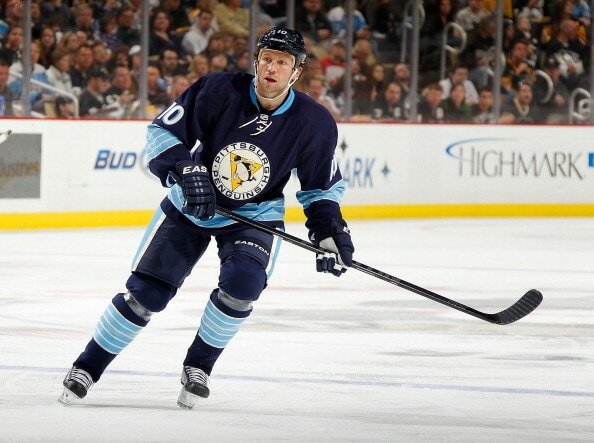 The set of Alternate jerseys were sold by the Pittsburgh Penguins to J&J Distributing. 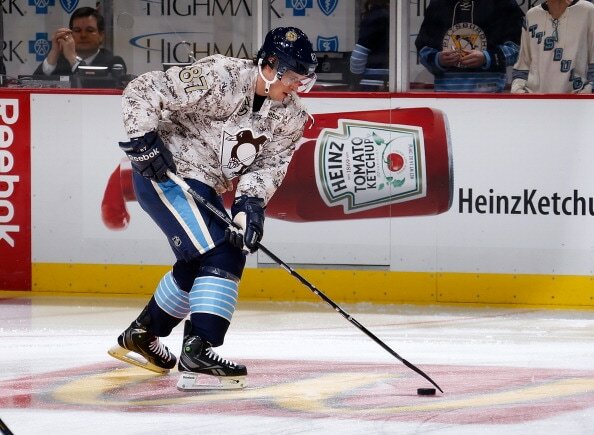 On February 24, 2013, the Penguins wore a special set of "Support Our Heroes" jerseys for pre-game warm-ups prior to the game against the Tampa Bay Lightning at CONSOL Energy Center. The digital camouflage print jerseys featured the Reebok wordmark logo on the left chest and size jock tag on the lower left front. A special set tag was also sewn inside the back hem of each jersey. A total of 24 jerseys were prepared for the event as evidenced by a photo posted on Head Equipment Manager Dana Heinze's Twitter account; however, only 23 players were listed on the NHL Roster Report for the game including three scratches including Zach Boychuk, Robert Bortuzzo, and Evgeni Malkin. On March 12, 2013, the Penguins wore a special set of "Hockey Fights Cancer" jerseys for pre-game warm-ups prior to the game against the Boston Bruins at CONSOL Energy Center. Hockey Fights Cancer, normally held each October; however, due to the NHL lockout, was held in March 2013 as part of a league-wide initiative to raise awareness and funds for cancer research. The purple jerseys featured the Reebok wordmark logo on the left chest and size jock tag on the lower left front. A special set tag was also sewn inside the back hem of each jersey. A total of 23 jerseys were prepared for the event as evidenced by a photo posted on Head Equipment Manager Dana Heinze's Twitter account. 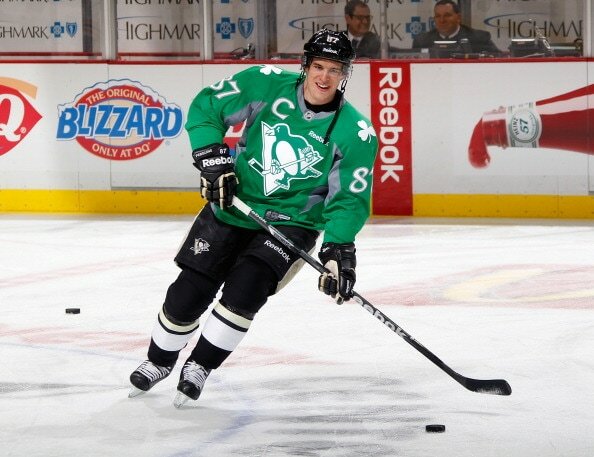 On March 17, 2013, the Penguins wore a special set of "St. Patrick's Day" jerseys for pre-game warm-ups prior to the game against the Boston Bruins at CONSOL Energy Center. The green jerseys featured a Reebok wordmark logo on the left chest as well as a United States of America flag on the right sleeve and an Ireland flag on the left sleeve below clover logos on both shoulders. A special set tag was also sewn inside the back hem of each jersey. The jerseys were autographed and auctioned on NHL Auctions with the proceeds benefiting the Pittsburgh Penguins Foundation. The winner of each auction also received a card with the player's name written in calligraphy and a description of what his first and last name mean. A total of 24 jerseys were auctioned by NHL Auctions from March 16, 2015 to March 30, 2015. The auction raised a total of $22,970.35. On April 20, 2013, the Pittsburgh Penguins visited the Boston Bruins at TD Garden in Boston and wore a new set of Road (white) jerseys featuring a circular "617" (Boston's area code) patch on the right chest to commemorate victims of the Boston Marathon tragedy. The entire set of jerseys was auctioned by the Mario Lemieux Foundation on NHL Auctions to benefit The One Fund Boston. The auction ran from April 22, 2013 to May 3, 2013. The One Fund Boston was established by Boston Mayor Thomas Menino and Massachusetts Governor Deval Patrick to raise funds to assist those families most affected by the tragic events at the Boston Marathon. The auction raised more than $53,000. 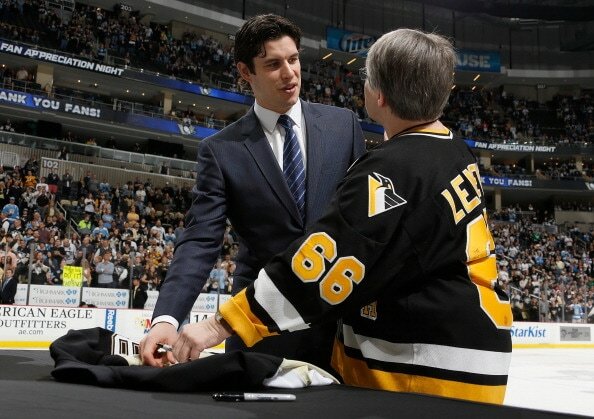 On April 27, 2013, the Penguins wore a special set of jerseys that were given to fans at the conclusion of the game vs. Carolina at CONSOL Energy Center. The Penguins wore their Home (black) jerseys for this game and they were tagged with a special "Shirt Off Your Back" set tag inside the back hem. A total of 23 jerseys were prepared for the game with 19 being game worn and four game issued. 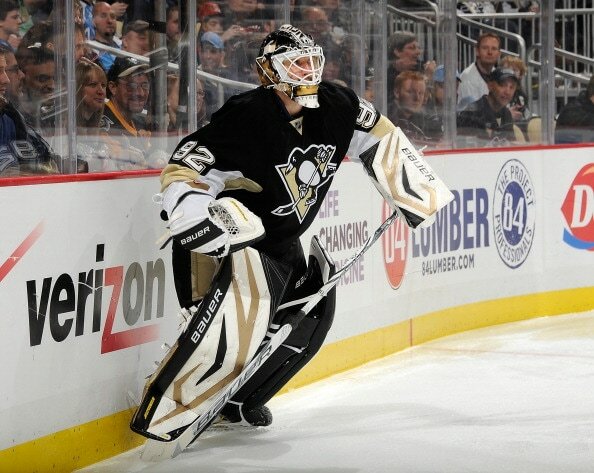 Christian Ehrhoff, Derrick Pouliot, and Kris Letang were scratched for the game. Dana Heinze (@realdanaheinze) tweeted a photo of the locker room set up on April 10, 2015 picturing 24 jerseys hanging in the locker room. Pascal Dupuis (November 20) and Scott Wilson was placed on injured reserve earlier in the season and a jersey was prepared for him to give away after the game. The Penguins began wearing their Stanley Cup Playoffs jerseys with the start of the 2013 Stanley Cup Playoffs on May 1, 2013 vs. New York Islanders. The set continued throughout the first three rounds of the Playoffs until the team was eliminated on June 7, 2013 at Boston. The Home (black) jerseys were worn in a total of eight games while the Road (white) jerseys were worn in a total of seven games. Each individual jersey within the set was worn as allocated by the Pittsburgh Penguins and Gleason Technology's JerseyTRAK reports should be referenced to determine exactly when each jersey was worn. 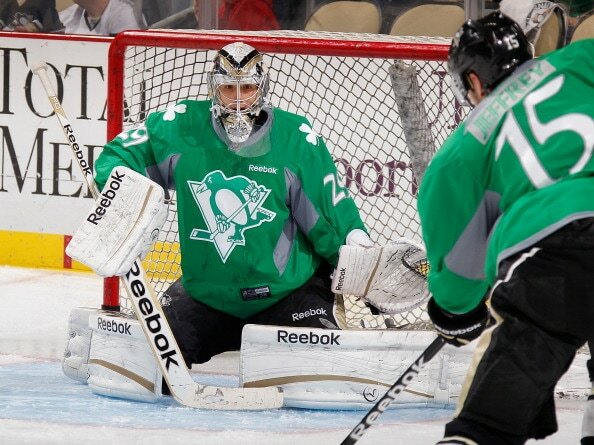 The Home (black) set of jerseys were sold by the Pittsburgh Penguins to J&J Distributing. The Road (white) set of jerseys were given to the players.